Arthur K. Wheelock Jr., “Willem van de Velde the Younger/Ships in a Gale/1660,” Dutch Paintings of the Seventeenth Century, NGA Online Editions, https://purl.org/nga/collection/artobject/112264 (accessed April 25, 2019). Willem van de Velde the Younger first gained his vast knowledge of the sea and sailing ships by studying under his father, the celebrated marine painter Willem van de Velde the Elder (1611–1693). The junior Van de Velde became skilled at depicting the flow of tides, the rippling of waters against a sandy shore, and raging storms that buffeted huge seafaring vessels and threatened to destroy them. The son’s work also shows a sensitivity to the effects of light and atmosphere, which he learned from his years in the studio of Simon de Vlieger (1600/1601–1653). Ships in a Gale is one of Van de Velde's early masterpieces. It is filled with the drama of a churning sea on which two storm-tossed ships struggle to avoid jagged rocks that have already claimed a third vessel. The painting is not only compositionally dramatic but also endlessly engaging in its details: figures scramble up masts, haul in the sails, and hang from lines attached to the bowsprit. As birds swoop over the foaming breakers, sailors fight the waves in their desperate attempt to reach the relative safety of the rocks before drowning. The painting is in extraordinary condition and has retained every element of its original character, particularly in the physicality of the ships, figures, and rocks and the translucency of clouds, sky, and water. I would like to thank Asher Kohn for his assistance on this entry. A fierce wind howling across the sky and whipping the water has created huge white-capped waves that relentlessly buffet two sailing ships, one flying a Dutch flag and the other an English flag. Their crews, having taken down the ships’ upper masts and furled their sails, desperately try to ride out the storm. The English ship to the right is in a particularly perilous state. Not only is it dangerously close to the looming, angular rocks rising from the deep, but it also flounders broadside to waves that crash violently over its gunwales. A mainsail has come unfurled and flaps wildly in the wind. Human tragedy seems imminent, particularly for the sailor who hangs precariously over the waves from a line attached to the bowsprit. In the foreground victims of the storm try desperately to save themselves. Some row through the turbulent surf in a small dinghy, while one sailor swims toward a large rock onto which two of his companions have already managed to scramble. Van de Velde enhanced the physical and emotional drama of this scene with his fluid brushwork, cool palette, and focused light effects. Cold, steel-gray clouds seem to move before one’s eyes, flowing diagonally across the sky, their dark thick forms at once overlapping and merging with lighter cloud masses. Pockets of light stream down on the foaming whitecaps, boats, and rocks below, accentuating and enlivening their forms. With great pictorial sensitivity Van de Velde juxtaposed the English ship against dark clouds while silhouetting the Dutch ship against a lighter and calmer portion of the sky. Van de Velde’s earliest dated painting is in the style of De Vlieger: A Dutch Merchant Ship Running between Rocks in Rough Weather, 1651, oil on panel, National Maritime Museum, London. See Westby Percival-Prescott, The Art of the Van de Veldes: Paintings and Drawings by the Great Dutch Marine Artists and Their English Followers (London, 1982), 66–67, no. 18. De Vlieger’s paintings, however, are more tonal in character and do not have the dramatic light effects that give Van de Velde’s painting such poignancy. Van de Velde’s ships and the ways they move in the water, moreover, are remarkably accurate, the result of the thorough training he received in the workshop of his father, Willem van de Velde the Elder (Dutch, 1611 - 1693). Westby Percival-Prescott, The Art of the Van de Veldes: Paintings and Drawings by the Great Dutch Marine Artists and Their English Followers (London, 1982), 117, no. 123. This painting depicts the Dutch ship Jupiter, which was one of the vessels lost on that occasion. Unlike the latter work, none of the ships in the National Gallery of Art painting can be specifically identified, but it seems probable that the same incident served as the inspiration for both scenes. Probably Proley (or Proly) collection, Paris; (sale, Hôtel de Bullion by Paillet and Boileau, Paris, 20 March 1787 and days following, possibly no. 114). brought to England 1823 by (Thomas Emmerson, London). Jeremiah Harman [1763-1844], Higham House, Woodford, by 1835; (his estate sale, Christie & Manson, London, 17-18 May 1844, 2nd day, no. 106, as A Storm and Shipwreck); Edmund Higginson [1802-1871], Saltmarshe Castle; (his sale, Christie & Manson, London, 4-6 June 1846, no. 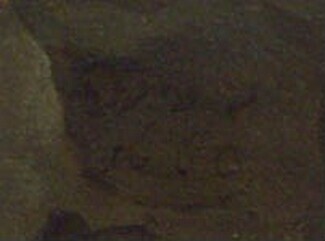 218, as A Storm and Shipwreck); purchased by Brown. Edmund Higginson, Saltmarshe Castle; (his sale, Christie, Manson & Woods, London, 16 June 1860, no. 32, as A Storm and Shipwreck); purchased by Turner. Edward Sholto, 3rd baron Penrhyn [1864-1927], London; (sale, Sotheby's, London, 3 December 1924, no. 79, as Rocky Coast with choppy sea and shipping). possibly with (Hand, London); sold to private collection, United States, possibly Samuel Borchard [d. 1930], New York; his estate; (his estate sale, Parke-Bernet, New York, 9 January 1947, no. 38, as A Shipwreck in a Storm off a Rocky Coast); private collection, South America; (Otto Nauman, New York); purchased 16 June 2000 by NGA. The following provenance is given in the prospectus prepared by Otto Naumann at the time of the sale in 2000, in NGA curatorial files. This sale included more than twenty works by Van de Velde. See the description of Sale F-A1806 in The Getty Provenance Index Databases. John Smith, A Complete Catalogue Raisonné of the Works of the Most Eminent Dutch, Flemish, and French Painters, 9 vols., London, 1829-1842: 6(1835):327-328, no. 26. According to a handwritten note in John Smith's sale catalogue, the painting was bought by Turner for 153 pounds, 6 shillings. A copy of the sale catalogue at the Getty Research Library is also annotated with the same information (copy in NGA curatorial files). Stuart Borchard, Samuel's son, lent the painting to a 1942 exhibition at the Detroit Institute of Arts. The 1947 sale of the "Samuel Borchard Collection" was, according to the sale catalogue, "by order of Stuart Borchard." Michael Strang Robinson, Van De Velde: A Catalogue of the Paintings of the Elder and the Younger Willem van de Velde, 2 vols., Greenwich, 1990: 2:1036-1038, no. 391, incorrectly states that the painting was sold by "Stuart Borchard's son" at the 1947 sale. The dealer's prospectus indicates that the private owner in South America probably acquired the painting at the 1947 sale. Five Centuries of Marine Paintings, Detroit Institute of Arts, 1942, no. 35. The painting is executed on a thin, oak panel consisting of three boards with horizontal grain, which are joined horizontally. The top plank is thicker than the other two making up the support. The reverse of the panel is beveled at the edges. The panel was prepared for painting with a medium thick, creamy white ground layer. A brown imprimatura exists beneath the water. In general the painting was executed in thin layers of paint with little texture. The paint in the sky was applied with a relatively large brush. The boats were executed in a more exacting fashion with smaller brushes. The highlights are generally executed with thicker paint showing low impasto. The X-radiographs show many changes including several sailboats that are much larger in scale than the current boats, as well as some figures and a different sky. The condition of the painting is excellent. Inpainting scattered throughout the composition seems to cover slight stains, wood grain, and tiny losses. The inpainting is concentrated along the edges and the upper join. The varnish is even and fairly clear. Smith, John. A Catalogue Raisonné of the Works of the Most Eminent Dutch, Flemish and French Painters. 9 vols. London, 1829-1842: 6(1835):327-328, no. 26. Hofstede de Groot, Cornelis. A Catalogue Raisonné of the Works of the Most Eminent Dutch Painters of the Seventeenth Century. 8 vols. Translated by Edward G. Hawke. London, 1907-1927: 7(1923):possibly 108, no. 427. Hofstede de Groot, Cornelis. Beschreibendes und kritisches Verzeichnis der Werke der hervorragendsten holländischen Maler des XVII. Jahrhunderts. 10 vols. Esslingen and Paris, 1907-1928: 7(1918):possibly 335, no. 427. Valentiner, Wilhelm R. Loan Exhibition of Dutch Paintings of the Seventeenth Century. Exh. cat. Detroit Institute of Arts. Detroit, 1925: 14, no. 35. Valentiner, Wilhelm R., and Francis Waring Robinson. Five Centuries of Marine Painting. Exh. cat. Detroit Institute of Arts, 1942: 14, no. 35. Robinson, Michael Strang. Van de Velde: A Catalogue of the Paintings of the Elder and the Younger Willem van de Velde. 2 vols. Greenwich, 1990: 2:1036-1038, no. 391, repro. Beer, Gerlinde de. Ludolf Backhuysen (1630 - 1708): sein Leben und Werk. Zwolle, 2002: 182, fig. 236. I would like to thank Asher Kohn for his assistance on this entry. 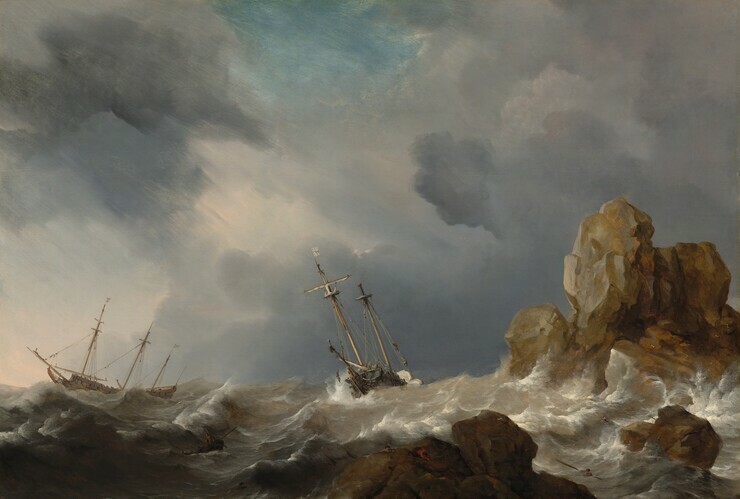 Van de Velde’s earliest dated painting is in the style of De Vlieger: A Dutch Merchant Ship Running between Rocks in Rough Weather, 1651, oil on panel, National Maritime Museum, London. See Westby Percival-Prescott, The Art of the Van de Veldes: Paintings and Drawings by the Great Dutch Marine Artists and Their English Followers (London, 1982), 66–67, no. 18. For an excellent study of this theme in Dutch art see Lawrence O. Goedde, Tempest and Shipwreck in Dutch and Flemish Art: Convention, Rhetoric, and Interpretation (University Park, PA, 1989). The theme of storm-tossed ships threatened by rocky shores appears in various emblem books. In Andrea Alciati’s Emblemata (Leiden, 1556), for example, this motif represented danger to the ship of state, whereas Adriaan Spinniker, in his Leerzaame Zinnebeelden (Haarlem, 1714), used it to illustrate the dangers to the soul that result from a life unmindful of God. Michael Strang Robinson, Van de Velde: A Catalogue of the Paintings of the Elder and the Younger Willem van de Velde, 2 vols. (London, 1990), 2:1036, suggested that the painting was commissioned to commemorate the “wreck of an English ship and the presumed saving of the Dutch ship” in 1653 after the Dutch had captured the English ship in the Mediterranean. Westby Percival-Prescott, The Art of the Van de Veldes: Paintings and Drawings by the Great Dutch Marine Artists and Their English Followers (London, 1982), 117, no. 123. This painting depicts the Dutch ship Jupiter, which was one of the vessels lost on that occasion.